Think you know Bourbon? Koval Single Barrel is likely to be the most unique Bourbon you have ever tasted. We just LOVE the smell of innovation in the morning! If you call yourself a Bourbon fan, you probably know that you can’t call it Bourbon unless you follow a bunch of rules. Fair enough. One of those rules is that Bourbon is at least 51% Corn. The rest is usually a chefs-choice of rye, barley, and wheat. But … the good folks at Koval had their legal team pour over the fine print, and—sure enough—it doesn’t HAVE to be rye, barley, and wheat. As long as you have the corn part right, the rest can be any other grain. Anyway … Koval starts with corn and then finishes off the mash bill with millet and the result is unlike any other Bourbon we’ve tasted so far with a fruit-forward character that compliments the sweetness of the corn. Everything else is just how you want it … new oak casks, proper aging, etc. 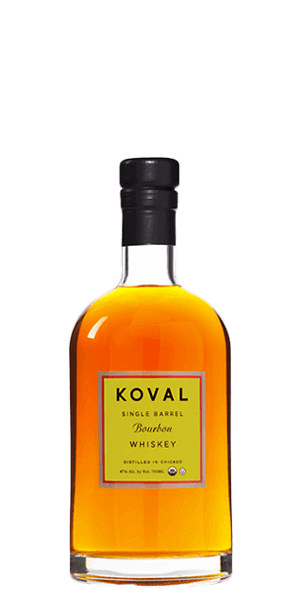 Some folks talk a good innovation game, but Koval brings the small-batch and single-barrel goods. If you are not intrigued yet, then someone broke your sense of wonder and we feel sorry for you. Millet has been used to make distilled spirits in Nepal for more than a century. Traditional Nepalese “Whiskies” made with millet include Tongba (a steeped whiskey-like drink filtered through a special bamboo straw), Raksi (similar to a cross between Gin and Japanese Saki), and Chhaang (similar to beer and made with millet, rice, and/or barley). What does Koval Single Barrel Bourbon Whiskey taste like? The Flavor Spiral™ shows the most common flavors that you'll taste in Koval Single Barrel Bourbon Whiskey and gives you a chance to have a taste of it before actually tasting it. Dried apricots and crème brûlée with spiced caramel and a hint of tobacco. Long, smooth, and gently sweet. Really smooth and sweet with a spicy finish. This is a very smooth bourbon that is nice and sweet, but not overly sweet, with really no spice to it. Using millet instead of the normal grains as the minority share of the grain bill really brings out a nice flavor profile that I haven't seen anywhere else. This may become a mainstay in my bar. My fav of the three in the tasting box. One of the most unique bourbons I’ve tasted. It is a smooth and complex bourbon that would be great for sipping. The light smooth sweetness makes this bottle a must have for me. There's a hint of banana and I want more!!!! Rich, smooth and slightly sweet. Unique character. Sip-able on ice. Acetone on the nose. Light fruit notes on the palette. Medium finish. Good, but not great bourbon. I like a bourbon that smooth with only a little burn going down and that is Koval hands down. I'm not able to define all the nuances of aromas and flavors and such.... But this smooth and flavorful bourbon has become my favorite, and I find myself licking my lips for quite some time after enjoying a drink. Being a novice at this, my first sip was rough. There was a sharpness that surprised. However, knowing that with practice I would become a better connoisseur I tried another sip. This time I let the bourbon rest in my mouth a little before swallowing. Much smoother. The flavor lingered and I had a good warming sensation. I added a couple ice cubes and chilled this bourbon is great for sipping. Again, this is my first tasting and I hope to learn to fully appreciate the complexities. Nice mellow bourbon! Love it! There many great layers of flavor. What a great taste perfect over a cube of ice. Highly recommended!!!! Oaky first and foremost, but semi-sweet, semi dry with a nice smooth finish. Second fav of the "craft side of bourbon" box. Goes down easy. Great mix of flavors. I would not say it was too sweet as others have commented. I would buy it again. Flavorful but a bit too sweet for me. Nice a smooth. Light flavor with a robust finish. Smooth, sweet with a hint of peaches. Smooth. I am mostly a Scotch drinker, that being said, I occasionally, like the sweetness of a Bourbon. This was excellent, typically, for Bourbon I drink Woodford Reserve Double Oaked. This has become my new Bourbon, hands down. Loved this! The caramel flavor is rich and deep. If you enjoy a sweet, full bodied dram, this will certainly be worth trying. Before Koval, my impression of Chicago was the destination of the lovable loser. You may say to yourself, 'but the Cubbies won the World Series last year in the most extravagant of fashions! Certainly not!' Well my friend, pull yourself from that bandwagon and embrace this particular spirit. Finally, in your glass, you will have something from Chicago that is truly worth celebrating! A sweet sophistication that, in my opinion, has a more velvet finish than that of Woodford (heavens to Betsy no!) and a lingering honey-suckle flavor that reminds you of that fall classic one year ago. I was quite surprised to find this Chicago treasure measure up to its Kentucky kin. I would definitely keep this on the must have list going forward. I didn't enjoy this bourbon at all. It has a watered down taste with a burn that didn't pay off. Light, easy to sip over a rock or not. Nice before dinner or prior to heading out for the night. Smooooth! Few has a strong caramel/honey flavor. I loved this!!! Very smooth. Good flavor. Carries interesting notes that offset the harshness of the mouth feel. A much better flavor than Gentleman Jack or Single Barrel Jack Daniels. Was a little rough for me at first sip. I ended up mixing it to finish my drink. Not something I would keep in my rotation. Really smooth finish. No bite to it. IT HAD A GREAT TASTE AN NOT A LONG LINGERING AFTER TATE WHICH I LIKED ABOUT IT. IT IS A GREAT SIPPIN DRINK NEAT. I WOULD NOT RUIN THE FLAVOR BY DILUTING IT WITH A MIXER. IT WAS JUST A GOOD ALL ROUND DRINK FOR ME!!!! GREAT JOB!! Nice vanilla and carmel flavor. Too much alcohol on the tongue. Fantastic depth of flavor. My first foray into bourbons on this site. I was not disappointed. Pretty smooth, many different notes. Smooth and sweet. Easy to drink with friends. A very light taste with caramel notes. Great for sipping neat. I line the sweet caramel flavor all the way through, and it has a little fire to it. Nice medium color. I caught some sweetness in both the aroma and taste but couldn't put my finger on it - chocolate, caramel, vanilla? The flavor didn't last long, but the throat sting of the alcohol carried on for several minutes. Very alcoholic. Added a few drops of cold water and I only tasted sweetness. Not complex. A simple whisky. At the start all I smelled is nail polish remover. It stung hard and allowed nothing else in. The first sip was acrid and bitter. All I tasted was my tongue burning. Only after a 5 minute waiting period did anything remotely pleasurable come through. I find a slight amount of sweet caramel on the nose but it didn't last long. There is almost nothing sweet during the sip except a tiny amount of corn, and the burn after the wait was the same as the burn at the start. The corn and caramel are the only reason I even give this 4 stars. I wouldn't even use this as a mixer. There is nothing oaky or aged here and it seems like a waste of your time and money. This is get-you-drunk bourbon for people who have no palette. Reminded me too much of NyQuil. Tasted better with water. Smooth and a bit sweet. Smell: semi sweet Taste: sweet and dry, it's not bad at all but nothing to write home about. Throat: smooth, very smooth. Overall 65/100. I would drink it if served blindly but nothing about it screams to be asked for specifically. Best as a mixer. Hmmm... I was ok but I don't remember it very much. Not too sweet, remarkably smooth, I appreciated the fruit notes and almost expected florals when I sniffed it. I was pleased to find that there were no florals in it and It made kick myself for not having a cigar. I enjoyed the vey mild tobacco after flavor. I really love the finish not overly sweet. And the fruity flavors are pleasant nice sipping bourbon. I noticed the chemical taste that is mentioned in a lot of the reviews. Beyond that, I tasted carmel and cedar. This seems like a good bourbon to mix. VERY strong chemical smell and strong up front as well. After that it is smooth and the finish is nice. This was my favorite in the tasting box, smooth vanilla taste with no bite...would love to splurge on a bottle sometime. First off bourbon. ..yuck lol.. but it's the welcome box I don't like the sickly sour sweet corn taste in any bourbon and it influences reviews. This bourbon in simple speak reminds me of a bakery. It has a variety of baked goods qualities to it and almost finishes like a rum. Creative and flavorful Downside other than being bourbon... very potent, and has an almost medicinal or chemical bite to it. Very nice, balanced, rounded bourbon. Too good to use as a mixer, but this wasn't, for me, interesting enough to serve to guests or get through a dark night of the soul. The notes on the pin wheel was on the spot. While drinking, it gave me a sensibility of something magical. Something that warmed my soul and delighted my taste sensors. This had promise. Started out with a wonderful caramel nose and warming barley presence. Very smooth and silky.... and then nothing. Was waiting for the character to emerge but it seems lacking. A bit about my taste: I love Scotch and I am also a fan of things like Bulleit Rye, Templeton Rye and the occasional Bastille, French Whisky (one of my faves). That being said, Koval simply lacked any flavor profile other than a very "chemical" taste for me. It was almost like drinking straight alcohol. It was very harsh, bitter and generally unpleasant. I literally can't understand what some of the other reviewers are saying when describing corn tastes, or fruit overtones as they simply didn't exist. It was like I was drinking Acetone or some other chemical compound as opposed to a whiskey. Koval is certainly not one I will be adding to my home bar, nor could I recommend it to anyone. A whiskey for an unbuttoned flannel, beard wearing kinda guy. A smooth and robust whiskey that has a clean bite and a dry finish. First thing you taste is the barley, almost as if you walked into an old plank wood floor corner store (that smell) as a taste. Natural dry wood smell, that hits the back of your nose every sip. The sweet oak overpowers the faint corn taste and then finishes with a rich caramel-apricot taste leaving behind a thickness in your mouth as if you just smoked a sweet aromatic dark backwood tobacco leaf. It's one for the shelf, but tucked away as a third choice. A bit harsher than I like, but great flavor on the front end. Strong caramel nose and sweet palette. But I found it to have some strange taste, like nail polish, which it very hard to enjoy, not sure what it was. My coworkers described it as smooth but lacking character. I would give it another shot to see if I just tasted something incorrectly. I agree with Thomas. This was the best of the first tasting box. Nice smooth taste and one that I will purchase going forward. Definitely the best out of the first tasting box, I purchased a bottle. Has a nice spice to it and a little bite that I want, and expect from a single barrel. This one will definitely be in my usual rotation of sippers. My favorite from Flaviar so far. It is a bit spicy and sweet. I loved it....didn't need to mix it. Would have to agree that didn't taste any fruit but definitely the vanilla and caramel. Not bad, but not quite a sipper. I wouldn't turn it down, but I also wouldn't drink it neat again. As someone said, it would make a hell of a Manhattan. My favorite of the welcome box. It was very smooth and generally not bad. It seemed to be a little bland though. Could use some more flavor of some sort. I wouldn't pay $59 for it, but I wouldn't turn it down if someone offered it to me either. I enjoyed this, especially the spicy notes that pop up throughout. I'm not sure I got the dried apricots, or really any fruit notes, but there certainly was vanilla and caramel. It's not bad on it's own, but I bet it would make one hell of a Manhattan. This might be a mixer. We don't mix, just sip. It is not a sipper. I'd rather drink Jack (and I don't like Jack). Certainly the first of its kind that I've had. I love the mango and stone fruit notes especially. A little too costly for what I feel like it's worth, but I'm generally new to drinking whiskeys. She's a strong one, but at the same time isn't too harsh. Caramel profile was most prominent (imho). Considering I'm not usually a bourbon drinker, I was pleasantly surprised. Very Strong but it has good flavor. I was a bit disappointed. I received 3 samples and only two taster cards. For the price of the sample I could have bought a bottle of any one of these bourbons. Enjoyed the tasting....picked this as the top of the three I got. I'll buy it. Smooth but not the bite I was expecting, could have been bigger. That would have gotten my vote higher than an 8. Very good sipping bourbon with a clean finish. Warm and Smooth, yet smoky with a distinctive bite. Slight tongue numbing. Great for sipping. Bite was a bit strong for my preference. Apricot early fades to a beautiful rum raisin finish! First spirit I tasted out of my welcome box. I am very new to fine spirits so I will simply say I quite enjoyed it. Very smooth at room temperature, slight bight in the throat, plasant nubming of the tongue. Little to no aftertaste. Great for sipping. Nice smooth bourbon. I don't have much experience with bourbons but would be happy to enjoy this one again. Pleasantly surprised by this one in my welcome box. Mellow, smooth, a little sweetness. Oaky aftertaste. Pretty nice! I'd buy it. Unappealing aftertaste, almost like a cheap whiskey. Not for me. I was very surprised. This is a wonderful little bourbon. Sweet, smooth, with a woody finish. I may have to get a bottle soon. My first as well. Loved the caramel. Full buttery mouth coating start, sweet and slightly smoky middle, lingering alcoholic finish. Good but unlike the bourbons I know and love. The tobacco flavor comes across strong to me. If I had this to taste more often, I might get more of an appreciation for its distinction. This was in my first tester. It's got some pretty amazing flavor. Very mellow, almost no bite but the flavor is absolutely fantastic. It's a perfect sipping whiskey. Distinctively not Kentucky, which is ok with me. Much smoother and less bite than its neighbors to the south. Solid bourbon for sharing. Definitely get the sweetness and opens up more with a few drops of water. Over all smooth just didn't enjoy it over all. I thought it was pretty smooth and had a nice finish. A good all around whisky. Sweet, caramel, a little fruit on the nose. Not a long finish but deep, there's a lot going on here. My favorite from the welcome box. It was very nice and smooth. Noted the fruit and sweetness. Got the mango right away. Smooth as hell! Really enjoyed the subtle sweetness. The mango and apricot are not overwhelming. Not my favorite out of the "Welcome Box", Complex finish, I have a wimpy palate! First taste demonstrated heavy char and spice with an intense finish. After the one ice stone it began to mellow, featuring notes of sweet corn and butter, with a fruity finish. The aroma is somewhat complex. It's very smooth. Has a very small hint of sweet. The middle of the tongue feels the warmth. The back of the tongue has a bit of a burn. While tasty, im not crazy about the fruity taste. Smooth, fruity, not a typical bourbon that I'm used to a little to virginal,for my taste, I need a woman with some rough edges! My favorite of the welcome box. Delicious. It just hits hard on the outside of tongue. It's hard to taste the earthiness when everything is on fire. There may be hint of sweetness, but the end result or linger taste is more like licking an ashtray. Generally don't go in for Bourbon but this was fin. There was not enough to really taste and judge and give a score of what i think about it. Best out of the 3 pack welcome set. Smooth. Smooth, not an overpowering sweetness. Good smooth bourbon. Would recommend a bottle to friends. Love it very smooth no need for ice. Smells good, gently sweet with a hint of caramel, tabacco, mango and apricot. Smooth with a nice finish, worth stocking in the bar. I liked it though I found it strong in taste. New to bourbon, I could definitely drink more of this. 8 out of 10. Journeyman from the taste box was second, with Few coming in last. Great. Way better than anything other product is my testing. Blew Few away. I'm trying to get into bourbon from Scotch and Irish Whiskey land, but having a hard time of it. This drink has much of what I don't care for in bourbon. Great flavor, but not very smooth. Nice nose and spice flavors with a light finish. Add water and ice limit the flavors; recommend straight. Really impressed with this one. Nice, slightly sweet on the finish with corn and caramel. If I see this one on the shelf, I'll pick it up. Well done! Koval is a Mans drink. The woodiness really stands out to me with a long, smooth finish to let the many other fine bits of goodness rush around and make your mouth very happy. Stands out right away as what I see being a regular in my bar. The caramel jumps out like it's running the Kentucky Derby. A subtle tobacco aftertaste rounds out the sip. Koval was a very good creamy sipper, its birth is fruity yet sweet, a life of grain & custard, while its death is long & spicy. Initial vanilla, honey, floral and citrus. Mid of carmel, honey and alcohol. Long finish of orange peel, honey and smoke. The koval was good didn't care much for the other two though. Amazing taste. Very smooth with no aftertaste!!! We did NOT love the Koval. It had a metallic taste and lacked sweetness. It seemed unnecessarily harsh with very little payoff. This one is a hard pass. I really liked this one, has a unique character and smooth. $50 seems like a fair price to me. Very smooth even for a beginner like my self. Very smooth, slightly sweet, great vanilla taste. Not a bourbon guy but this is worth a taste. Smooth colorful and a tad sweet. Easier than makers and gentleman jack to sip. Nice, soft feel, sweet up front, dry finish, not too spicy. A little hot feeling though. Not my favorite, but I can drink this. By far the most miserable excuse for bourbon I've ever tasted. Paint thinner is cheaper and probably tastes better. They call it "herbal". I call it flat, flavorless, and insulting. Very strong and delicious! Let this one breathe for sure. Notes of dark caramel, slight sweetness, and apricot. Pungent, industrial cleaning agent smell, so you know it's potent and packs a wallop. Loved it, sitting around a campfire with friends talking about the days hunt. Very nice, the wife very much like it. She really liked it when mixed. It's a nice sipping but not quite the depth or finish that I like. 1st Taste of charcoal , Carmel notes, after the second taste it was stronger tasting as the port side came out but the sweetness of the apricot and mango also came out. The 3rd taste was caramel and become smoother and notes of chardness. Overall love the koval over exceeded my expectations and could see me sipping on glass after work to relax with. Very Smooth. Very Light Flavor. Not the best not the worst. I like my on the rock and a rock was definitely needed to open this up. I think this could use a couple more years in the barrel. Not bad. Needs one drop of water to open the fragrances a little. Otherwise you just smell alcohol. Honey and molasses in the nose. Flavor starts a little sharp and mellows into a sweet almost rye flavor. Long and slightly harsh smoky finish. You will tastes the smoke for a while. There are better bourbons out there for this price point. It tastes like a very young bourbon too. Maybe let it age a little longer to mellow it out a little. Very complex on the nose and taste. Slightly sweet and very smooth. Favorite from the welcome box. Not very much flavor. Seems empty. Pleasantly surprised. A very unique and complex flavor profile. Buttery mouthfeel eases the alcohol vapor. Pour and let it sit for 15 min or so to really open it up. Good, but could be a little smoother. Very, very nice - mellow and consistent through and through. Smooth with a semi sweet taste. Definitely worth taking your time to drink. You'll want to savor this bourbon. First off, very complex flavors. Can totally taste the tobacco and a bit of sweetness. Love it. Good on the back palette. Could def taste the tobacco. This was excellent! Loved the nose, sweet. The flavor was complex, simple burn, moved up to my sinus, caramel and a desert, like apple pie, then finishes with a hint of tobacco. I lived it. Tried it in the sample box, my favorite of the three. Still young, need time. Smooth, taste is a bit flat. Smells sweeter than it tastes. Smoother than I expected with a long finish. I enjoyed it but would not add it to my bar. Disappointing. Sweet, with a strangely unpleasant note - like it's trying too hard to be sweet, and has missed the definition of subtlety. Marginally drinkable, but not particularly smooth (though that might be the short aging of bourbon as compared to even low-end Whisky). Will avoid in the future. Nice long finish, not as sweet as I like but glad to see local products used. Somewhat smooth, but tastes like it was aged in garbage, which is probably the tobacco. I don't see myself ever tasting this brand again. I work out of state so I was looking forward to getting into my tasting box when I got the chance to come home and I did. I tried the Koval and it was really tasty. I'm not a mixer so I did it straight from the shot glass. 1 I threw back and the other I sipped. Excellent. I'm gone again for about another month but I look forward to testing the others and will make my decision on which I will order. If the other two are as good as the Koval, it would not be a stretch for me to order one of each. It was very good. My wife who is not a bourbon drinker said it was very smooth. I enjoyed this spirit. I could definitely taste the white oak. It had a nice smoothness to it. not too girly and not to harsh. I would consider buying more of this, but you're not selling any. Smooth, usually a rye whiskey drinker. Sold on this one! Far smoother than credit given prior to tasting. Out of the 3 in the tasting box Few - Journeyman - & Koval - For myself the Koval Takes it! Amazing. However, I will note that I am far from a Drink Cone suer. It was our favorite. Very smooth and flavorful. I enjoyed this gem very much! I will definitely be sipping on this again in my near future. Sooooo unique! You love it or hate it but it's deffinitively different. Very rich and smooth flavor. Very aromatic. All around delicious. Will definitely order!!! This was a very pleasant drink with no Ice or water. Very smooth and mild, a little sweet. A little burn on the first couple of sips in the back of the throat but still smooth. Not a bourbon guy. Not too complex. Not enough depth for my taste. But pleasant enough for sipping. Not my favorite. Too harsh. Fiery drink with a bit of a bit and a burn. Not the smoothest but will definitely warm you on a cold winter's night. I am terrible a determining flavors or smells. I am just at 'like it' or 'don't like it' person. The Koval I liked. it makes a good sipping bourbon. I'm not a bourbon guy... But these were interesting and OK in small quantities for me. Smells fruity, middle range in color. Strong tobacco taste. Would try again. Young but not bad. Beats the more common bourbons with mellow sweetness and a mature finish. Smoother than I thought it would be. Sweeter than I usually like, but I didn't mind this one at all. The port and fruit flavors were definitely present for me. It was a nice after dinner drink. Pleasantly sweet and smooth but not a lot of depth on my flavor pallet. Not the best but not the worst. Curious what it would taste like after 10 years in a barrel. This bourbon would be great for cocktails like Old Fashions or Mint Juleps. A little sweet, but pretty smooth. Not a lot of character though when sipped straight. Definitely wasn't a fan of the Koval. Very young, no complexity. Definitely sweet and fruity up front with an unpleasant alcohol burn (not a good spicy burn) on the back. No flavor on the finish. Very good! A sweeter flavor. Not too harsh. We really liked this one! Oddly sweet. Reminds me of Summer's in my Great Grandmothers kitchen. A very young bourbon that suffers for it's age. I loved it when I tried the sampler pack, but by the time I purchased a bottle my tastes had changed. Good for beginners. Literally my favorite bourbon, and I have tried at least 100. Deep, smoky barrel taste with a smooth, pleasant, full finish without the heavy bite. Surprised my favorite would be a newer player out of Chicago, but the bourbon is simply excellent. I did not like this one. It had a heavy taste of barley or plant. So good I just ordered a second bottle even though I still have half a bottle left. I am impressed with how smooth this is. What about the Kentucky thing with bourbon??? This is an extremely smooth bourbon. It has a really distinctive taste, and the finish has just the right amount of heat. It should interest any bourbon drinker whether they are a long time fan or a recent convert. Stunning. The nose kept a strong interest in the drink followed by a great taste. I received the sample of this in my welcome package and it was intriguing enough to want to try again. Definitely something I want to add to my collection. I really liked this Bourbon! Very unique with a nice soft & sweet finish! Unique, smooth, great finish, no burn, a hint of sweetness. Weird. Nose was strong of caramel and pears. Flavor was sweet and sugary. Not a lot of Depth to this one. Mostly sugar booze. I do want to try it again, but I'm not sure what id do with it.